There have been a few moments in life that I have surprised myself with my own strength. Hiking the Na Pali coast, natural childbirth (x2), and the Dr. Junger Clean Gut diet that I have been doing for the past 14 days. No coffee, alcohol, grains, sugar, fruit, or fun. I resisted pizza (x2), cut an Italian cream cake without a lick. I made apple crumb pie and while others oohed and aahed, I had raspberries with almond meal. We held dinner parties, a football party. Nothing swayed me. But last night I crumbled. My Achilles’ heel, it turns out, is William Chris Enchanté. I would say that I’d had a perfect track record until last night, but that wouldn’t be the case. I went to both the pick up party and industry party at William Chris last week. I had the tiniest of tastes, then dumped or shared, except for the Enchanté. I couldn’t resist; no dumping for this gem. But honestly, that’s some dang good will-power. Then last night, we made a belated birthday dinner for my father-in-law who is visiting from Sonoma. My husband and I teamed up to make something delicious that I could eat without cheating. We decided on grilled lamb chops with rosemary. For sides I made acorn squash with braised balsamic leeks and a kale salad which I massaged with avocado, garlic, lemon juice and salt. I was home free. Until my husband asked me to pick the wine. I tried to pick something I wouldn’t mind missing, but it was staring at me. I knew it would be perfect. Merlot, Cab, Malbec, Petite Verdot. The acid, bright cherry, subtle tannins. It was too much. And I knew that if I opened it, I would not be able to resist. So I did what any Texas-wine loving, soft-spined woman would do. I listened to my “gut” (ha,ha) and declared it Splurge Sunday. And I’m so glad I did. It was honestly one of the best pairings I’ve had in a long time. Each dish brought out a different nuance in the wine. A bite of acorn squash brought out subtle notes of baking spice. The lamb complimented the earthy Malbec notes. After the kale, the bright red cherry notes shined. 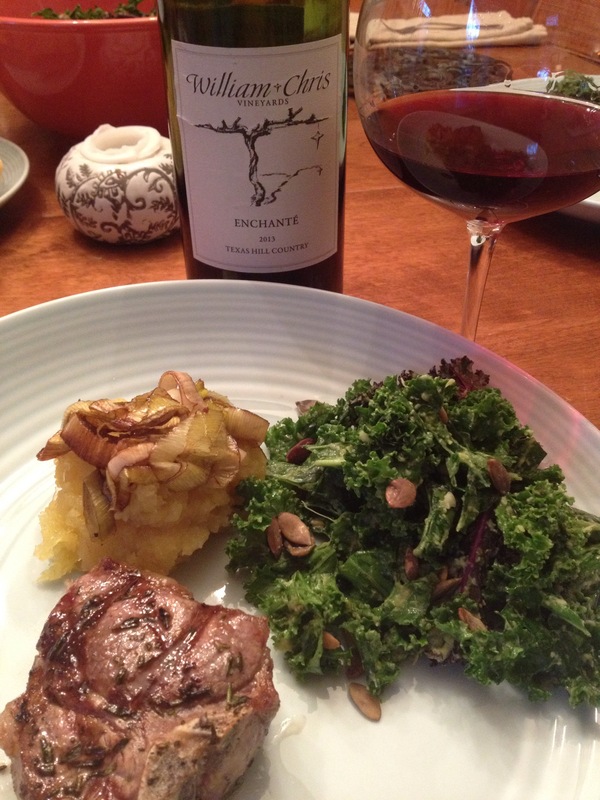 It’s not easy to impress my Sonoma father-in-law but the 2013 William Chris Enchanté did just that. How impressed was he? Well, I am writing this from the back seat on our way out there. Well done, gentleman. You made a believer out of him and broke my will. But it was well worth it. I may have to create my own “cleanse” that allows wine in moderation. The question is, do I pretend it never happened and continue to day 21? Or just avoid everything but wine on the weekends? I’ll be pondering that, but in the meantime, I’ll be planning my Texas Wine Month post-cleanse splurge. Cheers, y’all! You did much better than I would have in your position! Despite what the diet says, it was probably better for you to cheat a little on a great wine than find yourself in a comatose state with a sleeve of oreos in one hand and some cheez-its in the other. Indeed! Even off a cleanse I wouldn’t go that far ;). Dang pregnancies made me read too many labels. It’s a rare day for Cheetos but they are so good! Hahaha! It’s all good. I actually prefer Cheetos to Cheez-its. Not a huge fan of salty things in general, especially when they’re mass produced and filled with a bunch of junk, but cheetos are generally me weakness. William Chris is definitely one of my favorite finds since moving to Texas, and now I definitely have to get my hands on some Enchante! They just released 13. Grab it while you can! You can order some. Call Carol at WC. She’s great. Very well written! If this doesn’t turn people on to Enchante, I don’t know what will. Thanks! It sure is tasty trouble. Well done! Haven’t yet had Texas wine, but will keep this in mind when the opportunity arrives. The industry here is really growing in quality and quantity. I’d love to point you in the the right direction. Will be sure to ask – not traveling until after I graduate in June, but after that I will be asking!